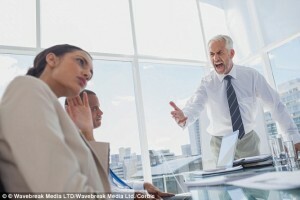 If your boss is pleasant one day, but lashes out the next, they may suffer from a phenomenon known as moral licensing. Researchers found that if a boss acts in an ethical way, they feel this good behaviour gives them a pass to mistreat employees. And walking the straight line also causes ego depletion, which researchers say can be combated by taking regular breaks during the day. ‘In the workplace, for example, it has been found that acting consistent with rules and norms pertaining to procedural fairness and vigilantly monitoring for potential problems are especially depleting,’ explained the study published in the Journal of Applied Psychology. 1.Do you think the workplace is a stressful place? 2. Are you surprised that bosses can give their staff heart problems? 3. What other things in the workplace are bad for your heart? 4. Do you think workers should be able to vote on whether their boss continues to be their boss? 6. Do you think workers should be able to sue companies if bosses give them heart problems? 7. What would you do if your boss was a monster who made your working life a daily nightmare?